Important Announcement from the California Bureaucracy! Sacramento (May 7) — This financial crisis is forcing California State and local agencies to make some tough decisions. If things continue for much longer, there’s a real risk that we may have to lay off Jose. Well, they’ve been digging that hole for over 4 years now, so I guess it’s time that an audit team from corporate HQ Turned up to review progress. it would be funny if it wasn’t true, also, all those guys are union members. If anybody want to see how “Atlas Shrugged” plays out in the real world, you can see it first here in California. The part of the bureaucrats was written especially for the Sacramento legislators. Nah! This is a link to tunnels at California’s southern most border. Jose is really an undercover Border Agent willing to hand over Mexican Cartel bosses’ to 10 (undercover) administration members from Holder’s DOJ. This operation is dubbed…Slow & Pissed. Now, ask yourself, who’s pissed? Jose? 11 DOJ undercover administration members? Holder? Napolitano? or Axelrod (get’s a cut from all the ‘action’)? The point is well taken, though it would have been nice to use a photograph that looks like it was taken in California. 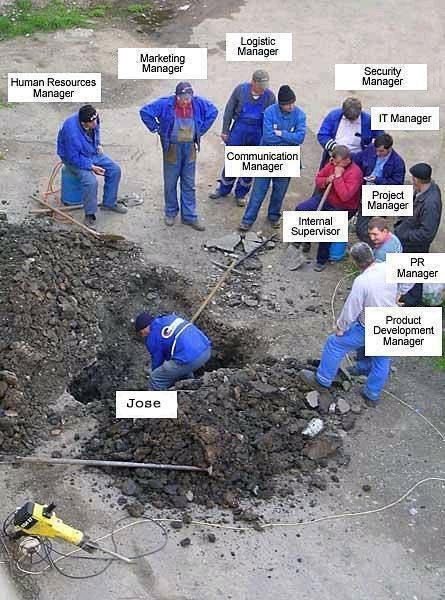 If I am not mistaken, the gentlemen in this photo might come from a FORMER peoples’ republic and Jose’s name is more likely to be Jozsef. Even more serious is that there isn’t an OSHA approved safety officer inspecting the excavation. This is obvious from the fact that the excavation is not sloped properly according to OSHA standards (1/1/2 foot slope for every 1 foot of depth of the excavation) without shoring or shields. What???? No union steward! This must be reported to the authorities. Grievances must be filed. Work must stop until the contracted for representation is available at all work sites. And no OSHA? What’s wrong with those people in Sacramento?!? It’s not just the government. I once worked for a “dynamic startup company” which had 18 managers and 4 programmers. Governor Arnold is flying to Greece to gain insights on how to balance the budget. He’s probably illegal, ask for his papers.